In my first year, we did an introduction to all disciplines of engineering. It was great as I was able to get a good grasp of each area. I gravitated toward the geotechnical and concrete side of things. I liked the way the lecturers taught the course. They made me interested, their teaching style was great and helped us understand the theory. The degree was a great challenge. The best way to stay motivated was to be persistent, I went to career fairs, and made the most of the facilities and the opportunities that existed. This helped me to become really interested in the discipline itself. And I was able to focus on a future career to motivate myself to finish the degree. Once I found that motivation it was easy to study. In my final year I met the company who had the contract for the Townsville Wharf. I had the opportunity to apply for a job there and was fortunate enough to get it. I believe that if you do a good job, this pays off with your connections in the industry and allows you more opportunities to immerse yourself in unique challenges. I’m proud of my work at the Townsville Wharf. There were so many facets to get involved in. I walked away from that feeling very proud – I put a lot of hard work into it and it ended up turning out really well. 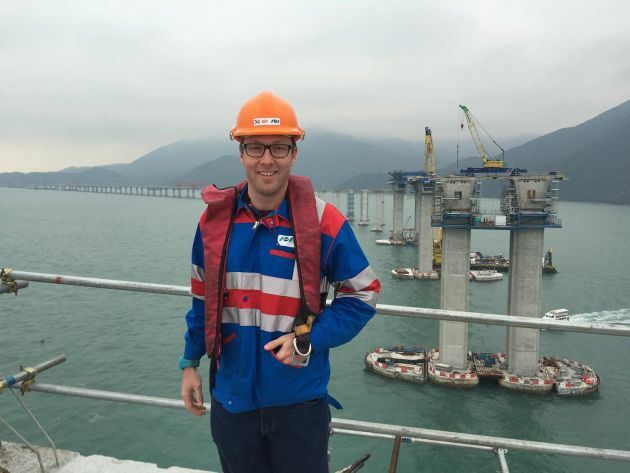 It was on the Townsville Wharf job that I met my current employer who gave me the opportunity to work as a Site Engineer on the Hong-Kong Zhuhai Macao Bridge (a 29km bridge that connects three different regions of China). I learnt a lot doing that job. Trying to manage people from very diverse backgrounds and getting them to gel together when they sometimes don’t want to, can be frustrating. I now use these people management skills in my current job where I manage a large number of stakeholders to design and construct new railway stations, removing the inefficient level crossings. I get a lot of satisfaction upgrading infrastructure to help make people’s lives easier. This is what makes my life purposeful and what drives me. I was fortunate to have studied at JCU, I wanted to stay around home and study at university. My lecturers had a great teaching style and it really helped me to understand the theory. Townsville is also a massive region, which allowed me to network quite a bit.